(Excuse the bad picture, do you know how hard it is to take a picture of the back of your own head!? Particularly with a heavy DSLR!? I assure you it looked better in person!) Anyway, I was reminded of a similar style I used to wear all the time: the claw clip. Do you remember these? 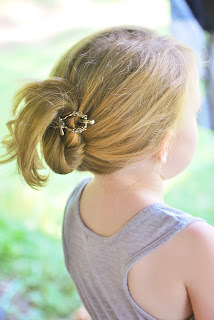 They weren't cute at all, but a very easy way to get your hair up quickly!! Though, they never seemed to stay for very long!! From the front, this gave the same type of look, but from the back...it actually looks CUTE! And it held my hair up ALL day!! I will admit that the next day when I went to try again, and could not for the life of me get my hair up! I had begun thinking that day one was just beginners luck, but as it turned out, it was user failure on my part...I was flipping my hair up and then twisting it, whereas I was supposed to twist the hair, and then flip up. I'm not sure if that makes sense now, but if you get one and find yourself having the same troubles, I hope it does then!! After I figured that out, I was back to being extremely happy with these wonderful clips!! It was certainly a welcome change from the boring old pony tail that I'd come to rely on when I was short on time! Another style I commonly wear is the half up ponytail. I have been wearing this style for as long as I can remember, and I admit, it's a little boring, but with my small flexi clip, it brought new life into this classic look. Looks much better that a regular old pony-tail too, don't you think? (Though I could have straightened my hair first I suppose) I also used this clip for a simple pony-tail, but did not get pictures. It was another great look, which I'm actually wearing right now!! The possibilities with these clips are endless...I am now a believer!! Cute, practical...the perfect hair accessory for the busy mom (woman) on the go!!! For more about the company, or our sponsor Independent Consultant Linda Menke, you can visit her website or check out her Facebook page!! I'm a pony tail sorry of girl to, but these would add a big girl look to my hair do. I hope I win. I am if to check out the website. I have a 3 year old an no time to make my hair look "amazing" these are really cute can't wait to try!! I'd love the hair sticks!!! I love the drop bun! Really looks good in your hair! I would like to try one of the clips- I like the Celtic knot version. I love that Celtic Knot pin! i like the flower blossom medley medium flexi! So cute and girly! Love them all! I am your new follower! Would you like to follow me back? I love the you pins! I love to put my hair up and these are so cute. I love to do the messy bun! These clips are simple, yet elegant! The Styling Video was very helpful! I really liked the French Twist and the Drop Bun.